160mm zoom, handheld, sports/action mode. PP included: straighten horizon, crop, levels/curves, airbrush, dodge/burn brush, change hue, blend/clone brush to clean up a few areas, Neat Image, save for Web. Oh MAN!!! I am so disappointed in the voters for how they rated this one!!! Jeeeeeez. . .what in the world were they thinking!!! What a perfect shot Jimmy!!! Best hummingbird shot out there! Great job Jimmy! 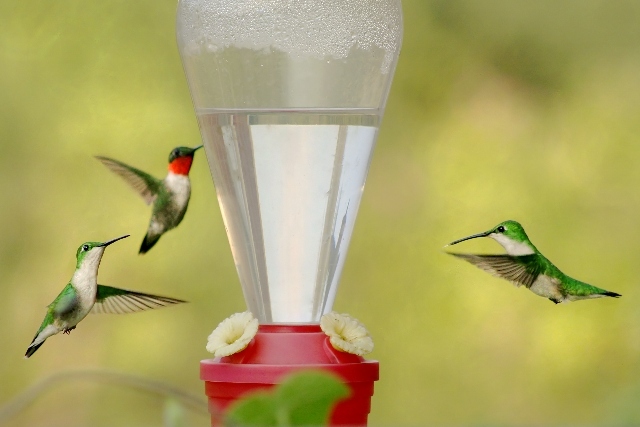 Captivating image, I love the inclusion of three birds, the distance renders the feeder a better accent to the image than some of the other entrant's close-up shots. Simply amazing. Very nice shot. Excellent job of stopping the action. now that's a moment. it could stand to be a bit sharper, though. That's fun getting so many hummingbirds at one time! ;^) Actually, in this case it helps having that third one even though the back one is a bit out of range for the aperture selected. I say it helps because odd numbers seem to balance an image better than even. Really don't have much to say in ways of trying to improve this. The two birds even with the feeder are nice and sharp, and most importantly (for this challenge) you've stopped the motion quite well. Good luck. Very very nice! I'd love to see this cropped even wider (crop off from the "flowers" down and from the waterline up). Might be a bit oversharpened, but this is an excellent shot! Great job at capturing 3 at once. When I even try to get one a meanie comes and chases it away. Whatever that is in lower left is a bit distracting. Proudly hosted by Sargasso Networks. Current Server Time: 04/19/2019 02:19:56 AM EDT.